The Montessori Method is an educational approach designed to take full advantage of the child's self motivation and unique abilities. It is based on self-directed activity, hands-on learning and collaborative play. We aid the child in developing their intellectual, physical, and psychological abilities. The Montessori School of Seattle encourages self confidence, independence and an enthusiasm for learning. In the Practical Life curriculum children are learning how to do living activities in a purposeful way. Practical life aims to help the child gain control in the coordination of their movement, and earn independence. At Montessori School of Seattle children concentrate on carefully pouring from glass pitcher to glass pitcher. They wash dishes, hammer at nails, stitch fabric, and polish apples. Montessori School of Seattle’s language works range from writing preparation though spelling, writing, reading, and grammar. We create long term language goals for our students. The child learns sounds through the visual, auditorial and kinesthetic channels. Together we read stories, write journals, and strengthen vocabulary. In the sensorial curriculum we build on developing the senses of the child. We introduce size, color, texture, and depth of perception. In signature Montessori material such as the pink tower and brown stair children observe the pink cubes increase in volume and the brown stairs increase in diameter. These works are designed to bring out the child’s awareness of touch, smell, color, and geometric shapes. 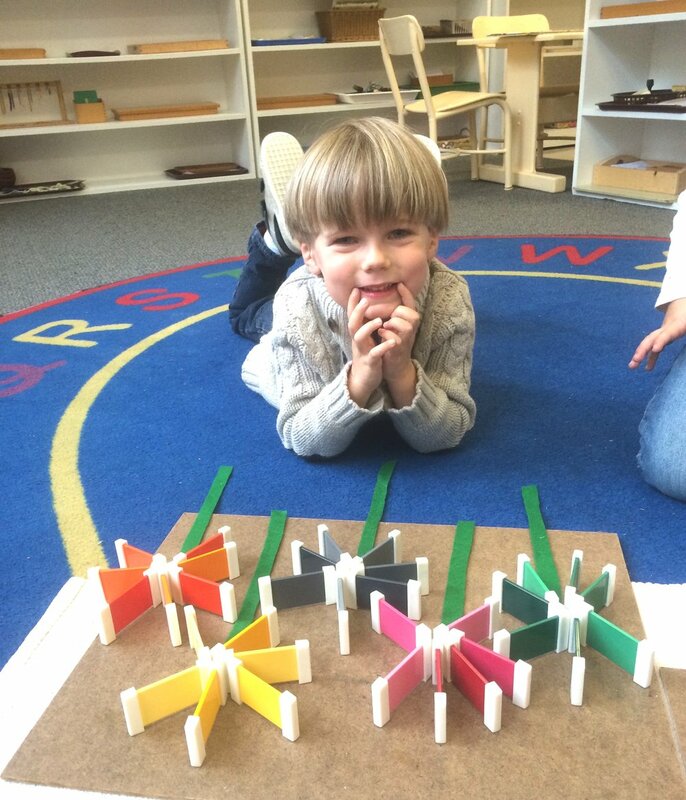 Children at Montessori School of Seattle love the beautiful materials and work diligently with them. Montessori School of Seattle provides attractive math materials ranging from number recognition to multiplication and division. Students count cakes into bakery shelves and add into the thousands with our golden beads. Children are kept stimulated and curious by the variety of challenges and our teachers' vivacity. Science is an exciting opportunity for our students to explore their world. Children learn about plants and weather, dinosaurs and the solar system. Our catchy songs explain a volcanos eruption. Children can peer through microscopes to inspect insects. In all of these ways they are able to broaden their understanding of the natural world in a fun way. Art is one of the many ways children express themselves. Montessori School of Seattle provides a multitude of materials to emphasize the process of creating art. Children are encouraged to explore and experiment. The art shelves are rotated monthly in seasonal themes. Mrs. Mott also prepares an extravagant weekly project. Children expand their creativity and take pride in the beauty they create. A cultural awareness is important to the Montessori School of Seattle. Every month children study a different continent. Our shelf is dedicated to maps, native animals, flags, and puzzles of that continent. On Continent Day the children learn about lifestyle and customs and even sample cuisines of a specific continent. Montessori School of Seattle is full of activities! We invite visitors like magicians and firemen into our classroom. We celebrate Native American story telling, and dress up for a halloween parade. The teachers enjoy creating unique and fun occasions for our students to partake in.